Georges Laugée was born in Montivilliers on December 19, 1853. 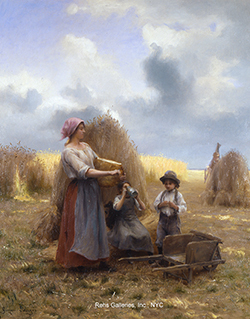 His father, Désiré Laugée, was an important French Realist artist; a contemporary of Jules Breton and specialized in portraying the workers in the field. Georges received his early training with his father and then, like many artists of his time, continued his studies at l’Ecole des Beaux-Arts. There he studied at the ateliers of Isidore Pils and Henri Lehmann – where he mastered the art of life studies and sketching. In 1877 he made his debut at the Paris Salon and in 1881 was awarded the bronze medal for his Salon entries of that year: En Octobre and Pauvre aveugle. 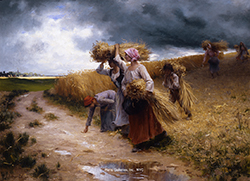 Following his love of nature and the farm worker, Laugée focused on scenes of everyday life. 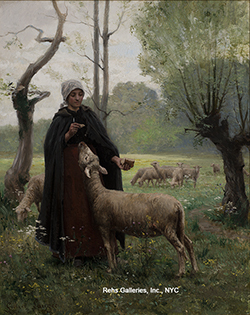 His works, often featuring the peasants tending their animals or working in the fields, are filled with light and realism. 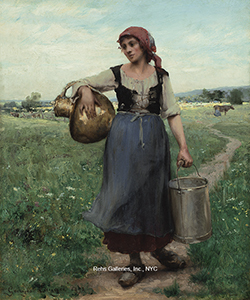 Among the works that Georges chose to exhibit at the Paris Salons were; his 1890 submissions Le Repos and Le Retour des Champs; 1897 submission Sous l’averse (In the Storm) and his 1904 works Deux Amies and Au Temps des blés murs, which portrayed peasant girls in the country. At the Salon of 1906 he exhibited Soleil Couchant (Sunset) and Heure doreé (Golden Hour) and continued to exhibit works of similar subject matter through 1928. In 1889 he participated in the Exposition Universelle, where he received a bronze medal and in the Exposition Universelle of 1900 was awarded the silver medal for his painting entitled Au printemps de la vie (In the Springtime). From 1907 – 1909 Laugée was a Membre du Comité de la Société des Artistes Français and was a member of the Jury at the Salon from 1908 – 1910. In every family, however impartial the parents try to feel, there is always one child for whom, could she bring herself to confess it, the mother has a place in her heart a little warmer than she keeps for any other. 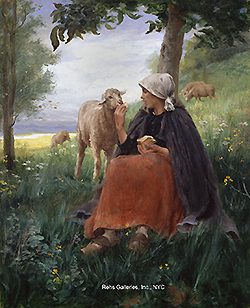 The little shepherdess in this charming picture is exemplifying this universal truth of human nature, in her quiet encouragement of the approaches of the favorite lamb of her little flock. This is the pet lamb that she helps over all the stony places, and with which she shares even her own frugal meal. 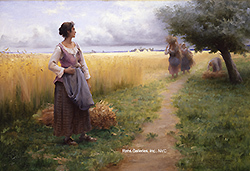 It is a simple story the artist has chosen to tell; but he has set it in a scene of tender and idyllic beauty, thoroughly appropriate to the gentle theme of affection he has selected for the central thought. He has contrasted effectively the simplicity of the shaded hillside nook, speckled with daisies and peopled with the inoffensive flock, and the ripe, full glory of the day, resplendent in the high-banked clouds, and reflected from the still surface of the breezeless summer lake. 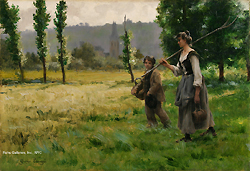 The photograph reproduction of this canvas has very successfully preserved the “painty” qualities of the original, so completely transferring to the engraving the technique of the artist that it is impossible that this should be anything other than what it is – a direct engraving from a masterly painting in oil colors. Laugée’s first atelier, located at 20, boulevard Flandrin, Paris, was also the home of the great realist artist Julien Dupré (Laugée’s brother-in-law) and just after Dupré’s death in 1910, Laugee moved to 23, boulevard Lannes. By 1923 he had relocated to 123, Rue de la Tour; where it appears that he remained for the rest of his life.